BURN THE WITCH Known by numerous names, "The Women's Holocaust", "The Burning Times", "The Great Witch Hunt", this sad chapter in Western History is only now beginning to get the full attention it deserves. 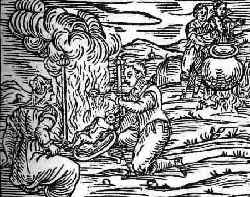 Both Catholics and Protestant churches persecuted witches. 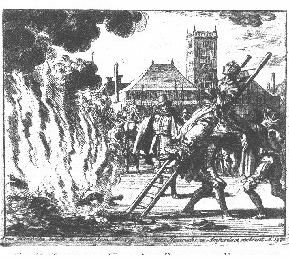 The only difference being the form of execution, Catholics burnt witches while Protestants hang them. OK, first lets get this over with; about the e-mail address the author uses -- [antique_andy@cathotlic.org]. Granted, I’m half Mexican, or Latino, or what-ever and YES, I did grow up in a Roman Catholic home; ---ok, there it is. BUT, at this time I see myself as an Episcopalian with some pagan overtures. However, this book is NOT the proper place to discuss the status of women, nor claims of infallibility etc. Suffice it to say, my personal beliefs or background will not cloud the present subject. Here before (see Section I), I have strongly defended the Catholic Church, against false and what must be considered out and out malaises and/or myth-Information. I have done this because as a historian I have felt it my duty to do so. Those ‘so-called’ pro-Medical Cannabis activists that are spreading such dis-information do themselves and all others a great disservice. 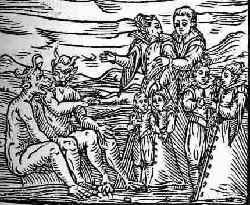 However, be that as it may, it is also a historical fact that between the 14th and 17th Centuries, between 30,000 and 300,000 individuals, many of them innocent, were (under the auspices of the Church) put to death as witches. THE INFAMOUS KISS The most famous of all wood-carvings. 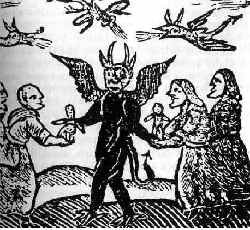 As part of a ritual (in order to seal the pact), initiating witches were required to kiss the Devil’s backside. Now here one can ask the question; What has all this to do with the subject of Medical Cannabis? Simply but, over 80% of those accused, tortured and executed for witchcraft were women. And unfortunately many of these women were older hags. Here I use the term “Hag” in its traditional form, meaning, “An older women of great wisdom, to whom people go to for advice.” Hags, that possessed much of the then known knowledge of medical herbs and plants. But maybe this needs further explanation. For obvious biological reasons, women carry, have and than take care of the young children. Thus woman, unlike males that went off hunting somewhere, traditionally stayed home and tended to the garden. Even to this day at the dinner table, in many cultures man serve the meat while women serve the vegetables. Thus, it becomes obvious why women tended to know more about medical herbs etc., then did their male counterparts. And the persecution of these women may hold the key to understanding why western medicine fell so far behind the Chinese, the Mohammedans, and just about everyone else. Remember that before the advent of modern chemistry; almost ALL our medicines came from medicinal herbs. And while in today’s world, most of us tend to think of gardens as solely places to grow roses or beautiful flowers etc., ORIGINALLY gardens began as places to grow medicinal herbs, spice plants etc., the beautiful flowers associated with gardens today, only came along sometime afterwards. Now, remembering that (at most) only 2% of the population at that time knew how to read/write, it then becomes obvious how much damage to our medical knowledge (including the use of Medical Cannabis) was done by the witch hunters. Had they not occurred, a lot of medical knowledge would have been able to have been orally handed down, instead have having to have been relearned from scratch. 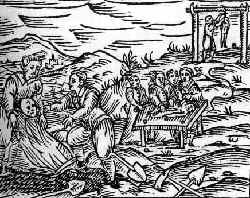 Desecrating The Dead Witches were often accused of grave robbing. The bodies were supposedly used in sealing their pacts with Satan or for use in magical rites of one sort or another. There are numerous time lines that can be found on this subject on the Internet (but watch it, ---many of them are full of errors). This one here is simply concerned with the origins of and the mechanical creation of the Witch-Hunters. As an aside; anyone who has studied the subject, can’t help but notice the similarities between the creation of the anti-witch laws and the anti-Medical Marihuana laws of the 1930’s. Between the creation of the Inquisition back then, and the Narcotics Police today. Things started out slowly, but then bit by bit, they became stronger, until a hysteria campaign was in full bloom. Anyone who has read the scriptures knows that women played a key and important role in the early church. Their houses were used as meeting holds and places of worship. They not only help finance the early church but served as ministers and preachers etc. Because women had such a high place in the early church and thus played a central role in running / decision making etc. It is no accident that no persecution of women healers was allowed to occur. The official position of the church in those days seems to have been that witchcraft (while possible), was null-and-voided through the power of Christ. That as long as you believed in Jesus, no demonic power could possible be used against you. Although playing a large role in the early church, by (around) 300-AD, women’s role/input in the affairs of the church had all but vanished, with an ALL-MALE high-archly firmly in place. [Just look at an Islamic society today and you’ll get the picture] And although very slowly at first, Christian attitudes toward the role of women now began to change. Elderly Hags, went from being seen as women of great wisdom and equals in the body of Christ, to more of a role resembling pray, pay, and obey. And, while NO active organized persecution accrued during this time, woman came under increasing social pressure to leave the medical professions and let more qualified males take over. “It is also not to be omitted that some wicked women, perverted by the Devil, seduced by illusions and phantasms of demons, believe and profess themselves, in the hours of night, to ride upon certain beasts with Diana, the goddess of pagans, and an innumerable multitude of women, and in the silence of the dead of night to traverse great spaces of earth, and to obey her commands as of their mistress, and to be summoned to her service on certain nights. . . . .
. . . the priests throughout their churches should preach with all insistence to the people that they may know this to be in every way false and that such phantasms are imposed on the minds of infidels and not by the divine but by the malignant spirit. . . . . 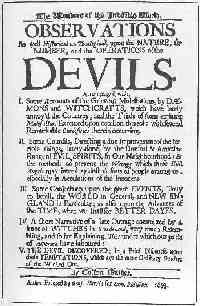 However, the political/religious landscape was changing, with a serious back and forth discourse taking place over the issue of witchcraft; Was it real or was it all imaginary? 1AD-to-1150-AD Up until this point, ignoring isolated incidents, NO officially sanctioned persecution of women by the church has taken place. However, the church did, through social stigma, discourage women from leadership and medical roles. This “Dis-Empowerment” of women, would at a later time (in effect) leave them powerless to defend themselves during the persecutions soon to come. Note the historical relationship between the time-lines to the Hysteria campaign. At the beginning, witchcraft is laughed at, yet by the end the hysteria is in full swing. It is also important to note that these were only the starts of the major ones. In terms of actual fighting -- that would continue for centuries yet to come. Thus the need (or excuse) to root out HERETICS --- a term technically meaning “the belief in a false faith,” but given the crusades, would better translate into the term TREASON. A holy crusade against the Cathars or Albigensians is declared by Pope Innocent III. 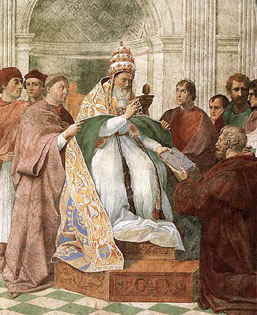 1227 -AD: In order to root out heresy (false religious teachings), Pope Gregory IX officially established the Inquisitional. However, it should be noted that this was only a formality and that the papal Inquisition had already been in existence for quite some time. By way of analogy: Everyone today has heard of the D.E.A. (Drug Enforcement Administration). BUT Wait, before then it was known as the Bureau of Narcotics (Harry Anslingers old group). BUT Wait, before that it was known as the Bureau or Prohibition. BUT Wait, before that it was known as the Bureau of Chemistry, BUT Wait, before than . . . . . only the Devil knows, but it was there in some form or another. --- Point being made, the Inquisition had already been in existence long before this time. While the author is not gay, this really does sort of remind one of the Reefer Madness Hysteria campaign, just as it was beginning to take off in the early 1930’s. Made the Death penalty for Heresy almost mandatory. Was supposed to have given The Inquisition a limited form of diplomatic immunity against civil laws, thus in effect placing them entirely above the law. Ordered that ALL Christians give assistance in identification and seeking out witches and heretics on pain of excommunication. Ordered that local mayor civil authorities have the bull read in all public places designated by the Inquisitors, and to eliminate all local laws that run contrary to the Bull. But most damning of all, Authorizing seizure of property or goods owned by suspected Heretics. Very similar to the Drug Forfeiture Asset laws, used to intimidate people today by the Drug Police. Unfortunately, his wording of and of itself, left that one loop-hole, concerning the “Involvement of Heresy.” This would soon be translated into -- “All Witchcraft involved Heresy or false teachings,” thus a green light would be turned on. The Knights Templar, were accused by the church of invoking Satan, consorting with female demons, and worshipping black cats. Their order was disbanded by Pope Clement V.
BLACK CATS: ACCUSATION: That the Church destroyed cats because Church officials labeled them as the devil's helpers and agents in witchcraft [don’t know what this has to do with medical Cannabis, but it always seems to come up]. As much as I hate to say this, there may actually be some truth to this one. Until modern times, both the protestant as well as Catholic faiths seem to think very negatively of Cats. Note, no one knows exactly what cats have to do with medical Cannabis but for whatever reason they both have become inter-twined. When the bubonic plague hit Europe (1348), killing over 25 million people. After several experiences with epidemics, perceptive people recognized that rats were responsible for spreading the plague; communities in which domestic cats helped reduce the rat population experienced lower morbidity from plague. Pope John XXII - Finally authorized the Inquisition to go after witches, but only in a limited form. The "Decretal Super Illius Specula." The Black Death - Killed between 25 to 50% of Europe’s population. Witchcraft, Jews and Mohammedans are suspected of somehow creating/spreading the disease. Because of the nature of this book, we can avoid most of the gruesome details. Here it’s enough to say that between 25 to 50% of Europe’s population died of the disease. One can only imagine the kind of fear, if not out and out terror induced by the plague. People sought out protection in the form of the church and also someone to blame. Jews, Women, witches etc. Once more the whole atmosphere had completely changed. 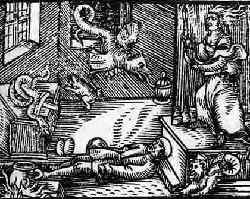 Instead of debating whether witches were real or not, it was now only a matter of how to deal with them. Gutenberg invents the printing press, making mass productions of book possible. Queen Isabella and King Ferdinand of Spain, request the creation of the Spanish Inquisition. 1150-to-1492-AD As has been seen, throughout this time-period the instruments of terror had come into existence ever so slowly. Church laws changed, new institutions were created and old ones modified. Even some of its original theologically ideology was modified to meet numerous factors (wars, plague etc. ), many of which were well outside of the churches control. Additionally, numerous other civil factors had taken place. Where once whole populations laughed at witchcraft, now it was accepted as common place. Yes witches were real. 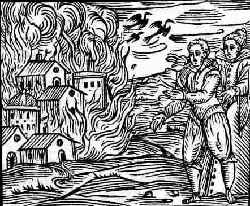 WITCHES USE MAGIC TO BURN-DOWN A TOWN Natural disasters were frequently blamed on witchcraft. Here this woodcarving illustrates two witches using the devils magic to burn a small town down to the ground. Pope Innocent VIII issued a papal bull "Summis Desiderantes" on Dec 5, 1484 which promoted the tracking down, torturing and executing of Satan worshipers. Remembering that by this time the Structure of the Inquisition, as well as its power to use torture and total immunity from criminal law, was well established in place. Thus many (maybe rightfully so) feel that this Papal Bull authorizing its use in Germany marks the beginning of the witch-hunts, or the Burning Times. The Malleus Maleficarum: aka The "Hammer of Witches", was first published by two sick-o’s, Jacob Sprenger and Heinrich Kramer. It basically described the process for seeking out, finding and destroying witches. 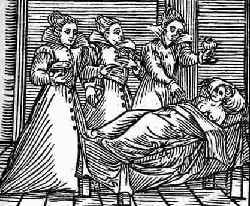 It took some pains to warn against women who posed as healers and midwives as they were in a position to do evil. Syphilis: - Europe was hit (many now believe that it was brought back with the crew of Christopher Columbus), with a very virulent strain of Syphilis. Europeans who had no biological defenses or knowledge of what Syphilis was at the time, naturally turned to the God for help. 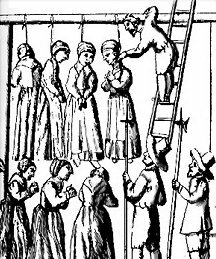 AFTER THIS POINT, THE WITCH HUNTS WERE WELL UNDER WAY, AND WOULD CONTINUE UNTIL THE EARLY 17th CENTURY. The only analog that can be used is the passage of the Marihuana Tax Act of 1937. To this day there are still people who believe that Medical Marihuana is the Killer Weed, the Weed of Madness etc. MARTIN LUTHUR: - Guided either by conscience or by stupidity, on Oct 31, 1517, Marin Luthur posts his 95 point theses against Indulgences on a church door. He is soon labeled a Heretic by the church but it is too late, many of Europe’s peoples had had it with the church, with its taxes, and with what they perceived as corruptions etc. "I should have no compassion on these witches; I would burn all of them." Below, are quotes from Martin Luther and John Calvan, both of which (no matter what your viewpoint) were both spokespersons in their day for the protestant movement. “. . . . it cannot be denied but that the devil liveth, yea, and reigneth throughout the whole world. Witchcraft and sorcery therefore are the works of the devil; whereby he doth not only hurt men, but also, by the permission of God, he sometimes destroyeth them.
. . . There is none of us so strong that he is able to resist him, and especially if he attempt to do it by his own strength. "Job was an upright and a just man, fearing God, and there was none like unto him upon the earth." Job 1. 8. But what power had he against the devil, when God withdrew his hand? Did not this holy man horribly fall? . . . . Of Witchcraft I have spoken before, in the third chapter. This vice was very common in these dour days, before the light and truth of the gospel was revealed. 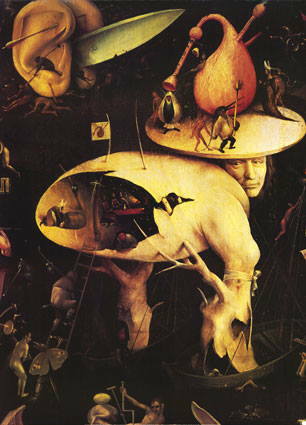 When I was a child, there were many witches and sorcerers, which bewitched both cattle and men, but specially children, and did great harm also otherwise; but now, in the light of the gospel, these things be not so commonly heard of, for the gospel thrusteth the devil out of his seat, with all his illusions. But now he bewitched men much more horribly, namely, with spiritual sorcery and witchcraft. Which is the same as saying, Same-O, Same-O, on with the oppression of women. And in case you think that all of the above is just so much idle-chatter, let us look at what was said just three years before the Salem witch trials by one Cotton Mather. Note that he was nether a Catholic nor a European. “WHAT Witchcraft is . . . WITCHCRAFT is the Doing of Strange (and for the most part ill) Things by the help of evil Spirits, . . . Witches are the Doers of Strange Things. . . . They do things which transcend the ordinary Course of Nature, and which puzzle the ordinary Sense of Mankind. Some strange things are done by them in a way of Real Production. . . . . Things which the Magicians of Egypt exhibited of old. . . . The Witches promise to serve the Devils, and the Devils promise to help the witches; . . . We have the Testimony of Scripture for it. . . . . Particularly, the Instance of the Witch at Endor, in [1 Sam. 28. 7]. Just three years letter Cotton Mathers would have the opportunity to put into practice what he preached in Salem Massachusetts. Witches Offering Children To The Devil The witches bring their children (either for sacrifice or for his blessing) to Satan. Due to the authors age, he has had the experience of meeting WWII holocaust deniers, Stalinist apologizers, Pol Pot, Edi Amin etc., deniers etc. Thus I must take some pains NOT to sound like one of them. But irregardless the truth is still the truth --- those who either deliberately, or through shear negligence, spread Myth-Information about the church/medical Cannabis, do all of us a disservice. Simply put they lower themselves to a level no better than that of the Drug Police. But on the other hand we must not go to the other extreme and be apologists for the churches (both Catholic and Protestant) activities. Wrong is still wrong, right is still right, and history is still history. . . That the church at the time saw evil and persecution throughout Europe . . . and recall that the Black Death took place at around the same time as the witch craze . . . thus people naturally believed that it was witchcraft, Jews, etc. . . and that the Inquisition had been created ONLY as a way to LIMIT the level of persecution . 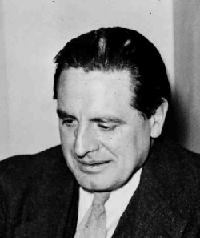 . . that given the level of hysteria at the time, it would have been much worse had it not existed etc. . . .
And indeed there is some truth to his words, according to Johannes Nohl; Jews were so suspected of creating the Black Death that the Pope had to issued two Bulls, one in July 4th, and on Sep 26, 1348, both of them officially forbidding both their slaughter as well as the stealing of their property, on the pain of excommunication. But be that as it may, killing of Jews kept on going. And let’s face facts, what better scapegoats than a group of politically powerless women -- Man they beat Jews any day. Were the churches actions justified given the condition? Did the churches actions set back western medical knowledge, especially with regards to Medical Cannabis? - William Woodward, legal medical director AMA, the quotation actually comes from a letter (sent to him by a pharmacists on the subject) that he attached to his own reply. April 28, 1930. - It was a radio program, I forgot the exact words, but it pretty much followed the stated line. [A]- Woodcarving attributed to “Guazzo's Compendium Maleficarum"
[C]- Original information found via - Hansen, Quellen, p. 1; Liber Sextus, V.2.8 Corpus luris Canonici, ed. E. Friedberg (Leipzig, 1877), Vol. 11, col. 1071-72. As noted in the book Witchcraft in Europe, a Documentary History by Alan Kors and Edward Peters.